It is always cool to get a new blues CD out of Canada, as they are often very entertaining. It seems like there is a lot of support for all genres of the music scene north of the border, and this community helps artists get a good foothold in the business. 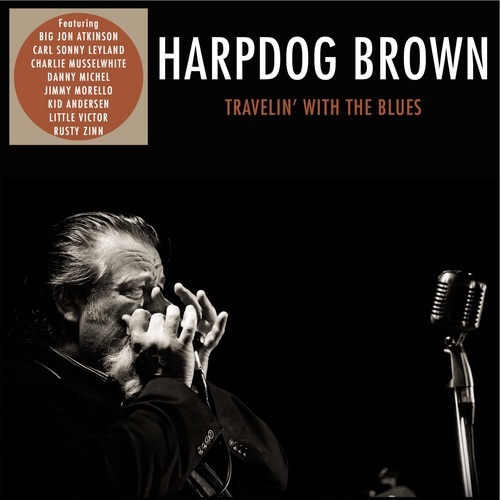 The new album from Harpdog Brown, Travelin' with the Blues, is no exception and this harmonica-driven disc is chock full of solid tunes and sweet guest artists. With seven albums under his belt, Harpdog Brown has been plying his trade since 1982, and after taking a decade off to help raise his son he is right back in the thick of things. He is a well-regarded singer and harp man, and over the past few years he has released two albums and won consecutive Maple Blues Awards for harmonica player of the year. This man is certainly still in his prime, as you will hear on this disc! Travelin' with the Blues has pretty much everything going for it. Little Victor produced this album, and it was cut by the go-to guys in the blues business: Jon Atkinson at Bigtone Records and Kid Anderson at Greaseland Studios. If you ever wish to make your own blues album, head up to the San Francisco Bay area and hit up one of these fellows and you will not regret your decision. Brown provides the vocals and most of the harmonica for this project, and joining him in the studio are Jordie Edmonds on guitar and Pat Darcus on bass. There are special guests galore, and blues fans will probably be able to recognize most (if not all) of the names. Many of the 14 tracks on Travelin' with the Blues are solid originals that were written by Brown, his bandmates, Little Victor, the guest artists, and Harpdog’s longtime collaborator, Wayne Berezan. Regardless of who wrote the songs, they all fit together well and there is a glorious 1950s feel to the proceedings thanks to Atkinson’s magical analog studio equipment. This is apparent on the opener, “Better Days,” a cool bit of Chicago electric blues that Wayne wrote. It features Harpdog’s hearty vocals and plenty of dirty guitar from Kid Anderson, not to mention a hauntingly distorted harmonica break. Berezan also penned the ballad “Sacrifice,” which allows Big Jon Atkinson to show off a bit of his guitar and drums as Carl Sonny Leyland sets the mood on the piano. Both of these tunes highlight how solid Brown is with the vocals, as he has a tremendous sense of timing and drama, as well as flawless enunciation. The originals also include a few standup tunes that Brown wrote. These include “For Better or Worse,” a 1950s rocker with Kid Andersen and Little Victor on guitar, “What’s Your Real Name” (the story of how Harpdog got his name), and “Home Is Where the Harp Is,” a re-do of a song from earlier in his career. These last two include some fancy guitar work from reggae master Rusty Zinn, another nugget of California gold. There are also a couple of noteworthy instrumentals worked into the set. Brown and Little Victor wrote “Moose on the Loose,” with a melody that hearkens back to the Champs’ “Tequila,” and an unexpected harmonica duet of Harpdog and the legendary Charlie Musselwhite. Then there is the closing boogie, “Hayward Blues,” a pick-up track that was recorded at the end of a session. This one has a healthy vamp from Jordie Edmonds (who wrote it) and Jimmy Morello, and a fun honking harmonica part from Harpdog. Though this one is only 95 seconds long, it is a wickedly fun way to close out the set. The covers include a handful of neat tunes. The band’s redux of Otis Span’s 1954 Chess Records single "It Must Have Been the Devil" is amazing, and California jazz master Carl Sonny Leyland does a fine job of occupying Spann’s place behind the piano. There is also Willie Dixon’s “Bring it on Home” which was originally cut by Sonny Boy Williamson II in 1963 and then covered on Led Zeppelin II. This version includes Jimmy Morello on the skins, and it is great to see that he is recording again! And finally, going a little further back in time, there is Jesse Thomas’ “Another Fool Like Me” and Muddy Waters’ “Hard Days Blues.” The latter is the standout of the cover tunes, and Brown’s quirky vocals are well accented by his harp as Little Victor lays down smooth guitar fills on this classic tune. As if 46 minutes of quality music is not enough, if you buy the hard copy of the CD you will also get 16 pages of liner notes with brief bios for the guest artists as well as producer’s notes for each of the tracks. This wealth of information is a welcome addition, and a neat throwback to the days where listening to music was a primary activity, not something that was done as an accompaniment to other everyday chores. Harpdog Brown has a winner with Travelin' with the Blues, and any fan of the harmonica or classic blues would be happy to have a copy of this disc in their library. Looking over Brown’s website, there is a passel of Canadian shows scheduled for this spring and summer, so if you are going to be north of the border, you might want to check out his schedule. He is a master of the harp, and certainly worth seeing in person! Harpdog Brown is a great man, and definitely worth seeing in person!